Moisture Absorber 450g for outstanding moisture and mould control. Moisture Absorber 450g Rechargable Pingi Bag. Moisture Absorber 450g – our top performer. 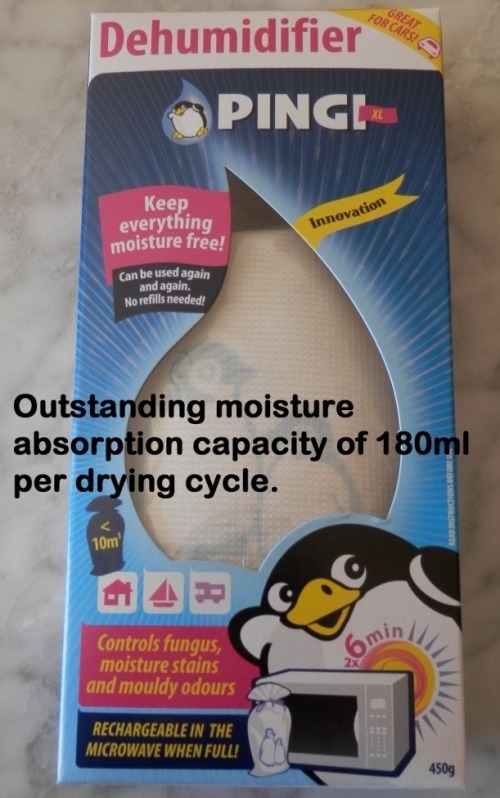 What makes our Moisture Absorber 450g so special? The moisture absorber 450g is the largest dehumidifying bag in our product range. It is best suited to enclosed spaces where the area is less than 11 cubic metres. The harmful effects of excess humidity is discussed in our post about moisture and mould. Many of us need help against mould incubation either with summer humidity or the winter damp. The moisture absorber 450g is cost effective and very easy to use all over your home. Most other rechargeable moisture absorbers/dehumidifiers require several hours in an oven before they can be used again. The PINGI Moisture Absorber 450g, however, can be recharged in a microwave in just a few minutes. Advanced technology and constant testing. The PINGI moisture absorber 450g was designed in the Netherlands, by InnoGoods BV. Our moisture absorbing satchels have been extensively tested by TÜV Rheinland and Reach Laboratories in Hamburg. This ensures the highest quality and safety standards in Australia are met. We aim to provide safe cutting edge products. Most competitive dehumidifying bags/buckets on the market require refilling with salt-based absorbing agents. Moisture Absorber 450g is unique – they do not require refilling. The dehumidifying sachet contains silica gel pellets which absorbs moisture and holds it in suspension. No leakage possible! The Moisture Absorber 450g has a water absorption capacity of 180ml per cycle. Use this product of over the course of a year or more and it becomes so much cheaper than competitive moisture absorbers. No electricity is required during the moisture absorbing process. There is no risks to pets or small children coming into contact with the toxic waste water (as produced by some competing brands) as there is no waste water. Have a look at our Moisture Absorber Specials page for great value! Please have a look at how we approach our online customer service and sales.